Some family researchers find that they descend from ancestors that are famous for one reason or another. The 'fame' of their ancestors aids researchers who are trying to find information about them, because their names and records are recorded both in numerous histories and in association with the cause of their 'fame'. Let’s walk through the process of finding some well-known individuals who are famous because of their bad luck. The Willie and Martin Handcart Companies were comprised of members of the Church of Jesus Christ of Latter-day Saints who were migrating to Utah in the late summer – fall of 1856. Their ill-fated trek is well documented in numerous historical publications and on websites like this one and this one, as well as on the LDS Church Archives site which includes the members of the Martin Company and the Willie Company. Disaster struck the group when an early winter set in as they were still far from their destination. How can we discover if our ancestors were among this group or another well documented group of immigrants? Let's use the members of these companies as our examples for this discussion. The discussion will necessarily be brief given the fact that this is a blog and not a study guide. Follow the links in this posting to find indepth guidance and research aids to find your own ancestors. Identify the ancestors you know starting with yourself, then your parents, grandparents, etc. Use the steps listed on FamilySearch to aid in your quest. Download a copy of the pedigree and family group charts on the site and print copies of them. Fill in the information you already know. If you have a computer you'll probably want to use it to hold and organize your data. If you don't have family history software on your computer, you may want to download PAF or Legacy Family Tree. Both of these software packages are very good and offer a free version. But remember, you don't have to have genealogy software or a computer. Believe it or not, family history researchers didn't have computers until 'fairly' recently. However, I recommend using them if at all possible. Fill out the pedigree chart with the names of your ancestors as far back as you know them. If you don't know very many generations, call your parents, siblings and extended family and ask if they have information about your ancestors that they will share with you. Go to FamilySearch and search for the individuals who are in the last generation on the right side of your pedigree charts. Hopefully, other individuals have submitted information about your lineage. You'll want to confirm that their information is correct by visiting a library that holds well-sourced records about your family. The library you visit may be located in your city, at a university such as at BYU, at a branch Family History Library or at the main Family History Library in Salt Lake City. If you find connections between yourself and a member of the handcart companies.... great! Copy the information and use the libraries near you to find other records such as birth, marriage, death, census and probate records to confirm the information. If you don't find information that ties you to a member of the company, don't immediately give up your search. You've only just started an enjoyable quest. Use the tools found in the pages in the above links and those found on the Internet like Rootsweb and on family history related subscription sites to continue your search. You can also use a search engine like Google or one of the many other engines to search for your information about your ancestors. Remember to put quotes around their names to get more specific hits... like "John Jones". If you want to add a date or place to the search, it would look like this: "John Jones" + 1846 or "John Jones" + "Cleveland, Ohio", etc. Remember to read and include the wonderful Research Guidance publications on FamilySearch as tools in your quiver. 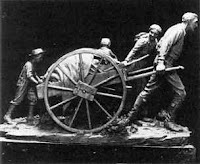 If you didn't find a link to the members of the handcart company, that is ok. Not many folks in the world descend from them, but we all descend from wonderful individuals. We just need to find them. Each generation of our ancestors is a full set of 'wonderful' people, regardless of their fame or entries in historical publications. If you are of the LDS faith, you'll want to check any ordinance work for the people in your databases and family group sheets at a branch library or ask your ward family history consultant for assistance. Remember to document all of the information you find. Without documentation, the data you collect makes a nice story, but that is all that it is -- a story. I recommend that you look at the excellent sourcing examples listed on the Legacy Family Tree site. The examples are applicable to both hard copy documents and genealogy software. Review these source formatting examples and implement something similar in your own databases or family group sheets. Whatever method you use, use it consistently so other researchers can follow the method you've used to record your sources. 1. Look through your home and put all family history related documents, photos, etc. together in one box or two. 2. Ask your family for a copy of any ancestral information they have collected and offer to share your findings with them. 3. Use FamilySearch and other online ancestral data websites to help you research from home or another location with an Internet connected computer. 4. Visit a local library or branch family history library and search their resources for information about your family. Remember to ask the assistants at the branch family history library or those in your local community or church for research assistance and suggestions. LASTLY, believe you are going to find information on your ancestors. By acting on that belief, miracles often happen in our ancestral quest. Make it happen in your own quest. Family history research doesn't require advanced education, it just requires action by the researcher and the use of the many tools and guidance publications available to all of us on the Internet and at the branch family history libraries located around the world.